Air Management is one of a kind (or two if you count its sequel) and gives the player the opportunity to control, build and operate an airline company in a way similar to other simulation games such as the famous Sim City. Player can play during two time periods, from 1963 to 1995 or from 1983 to 2015. It is interesting to notice that up to four players can enjoy the game at the same time, and all of this fueled by a round based system (they are actually controlled by AI during the single player mode). But let's go back to the game itself and talk about the simulation system. The game allows a lot of customization and parameterization : new flying routes, airplanes types, budget (fares, advertising, stock purchasing) and so forth. 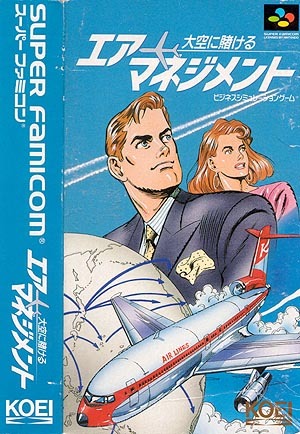 Other external elements affect the game such as other airline companies competing against the player's, weather conditions, airplane problems, strikes and all kind of world events such as accidents or even world conflicts and wars. You're ambitious and you strive for excellence. Your goal is to create a global airline network. You know travelers depend on your airline to get them where they want to go. Now convince them your airline is the best way to fly! A clean safety record, ad campaigns and special services will distinguish you from the rest. As your network expands, establish hub offices and invest in a hotel chain. Tourism will boost income and win passengers away from your competitors. Be aggressive and maintain superiority in the skies. Airlines are your business ! 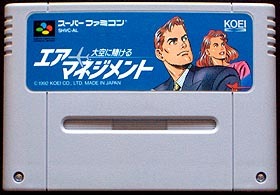 If you would like to play the original Japanese version, and because of the obvious language barrier, Air Management can be tricky to play at first. Like most of strategy/simulation games, this title features zillion of options, long menus and a quite thick instruction manual. If you still want to give this game a try, my advice would be to go for Aetrobiz, the American version. The game is however not that impressive and the overall experience quickly becomes overly complicated and convoluted. Everything is clear and correct, but you'll need to invest time in this one and I'm not sure if the reward/time ratio is worth the effort.